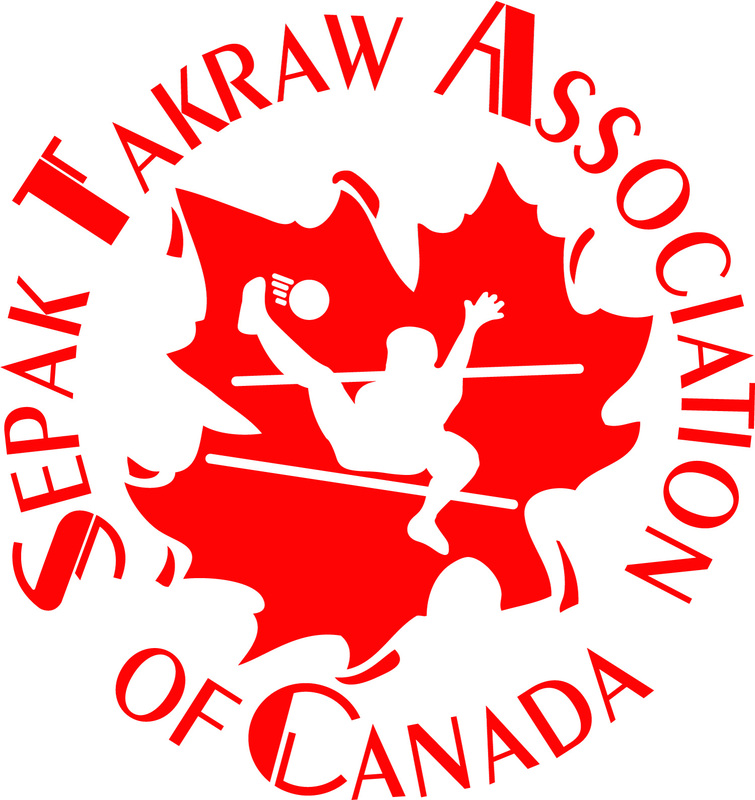 All paid Sepak Takraw Association of Canada (STAC) members and affiliated teams and clubs are expected to be actively playing and/or promoting Sepak Takraw while also working and cooperating with STAC and their own local provincial or regional organization/s in each others' efforts to grow the sport together, maintaining the highest standards of professionalism, integrity and good sportsmanship. 2.1.1. Host must book facilities that can accommodate at least two standard Sepak Takraw (doubles badminton) courts with a minimum of 6 m. of space in between and accommodate bleachers for spectators. 2.1.2. Host must book facilities that are as close to accommodations as possible. 2.2.1. Host is responsible for getting at least three bids for accommodation, to be submitted with proposal to host. 2.2.2. Accommodation must be as close to the tournament site as possible. 2.3.1. Standard nets, poles and balls must be used for all games. 2.3.2. Standard court boundaries, serving circles, forwards' semi-circles and center line must be clearly marked on all courts. 2.3.3. Note: all "standards" are as those sited in the ISTAF Rules of Sepak Takraw. 2.4.1. Host will be responsible for recruitment and scheduling of all tournament official referees, lines judges and scorekeepers. 2.4.2. Should officials be required from outside the host province, STAC must be notified within four months of the event. 2.5.1. The Judiciary Committee will consist of the Tournament Convener and three others, appointed by the Tournament Convener. 2.5.2.1. Appeals or protests must be filed to the Tournament Convener, in writing, within 30 minutes after the result of the match is announced. The Judiciary Committee must respond prior to the end of round robin or prior to the team's next playoff game. 2.5.2.2. Note: All other rules of the game to be followed will be as those published by ISTAF, including the approved amendments from the November 23, 1996 congress. 2.6.1. The Tournament Convener will be appointed by STAC within 4 months of the event. 2.6.2. The tournament convener may be changed due to extenuating circumstances. 2.7.1. The host will have the option of being responsible for organizing a banquet and awards ceremony, in which case all proceeds for this event will go to the host. 2.7.2. All awards/medals will be provided by STAC. 2.7.2.1. STAC will provide bronze, silver & gold teams with medals for up to a maximum of 5 people, consisting of 3 players and an alternate as well as the coach/manager. 2.7.2.2. STAC will provide awards for 3 all star players. 2.7.2.3. STAC will provide one award for the tournament Most Valuable Player. 2.8.1. An Emergency Action Plan must be prepared and included with the proposal to host the National Event. 2.8.2. This plan will be conveyed to participants at the scheduled coaches and umpires meetings. 2.9.1. A tournament budget must be prepared and submitted along with the proposal to host. 2.9.2. Budget must include: all revenues and expenses that the host committee expects to incur. 2.9.3. A follow up financial report must be forwarded to STAC 30 days after the event. 2.10.1. Host committee will be responsible for local promotion of the event on television, radio and in newspapers. 2.10.2. All publicity must include: STAC logos and those of the National and Provincial sponsors. 2.10.3. Proposals for host-STAC co-sponsorship of publicity may be considered, but need to be submitted to STAC in writing 6 months in advance of the tournament. 2.11.1. Host will be responsible for scheduling coach’s’ meetings and Referees’ meetings. 2.11.2. If seven or less teams are registered in the National Tournament, a round robin format will be adopted. If eight or more teams are registered, the teams will be pooled or tiered for round robin play. 2.12.1. Host will be responsible for transportation of participants, if required, from airport to accommodation and accommodation to tournament site. 2.13.1. Host will be responsible for all merchandise sales at the National Tournament. 2.13.2. All merchandise must contain STAC's official logo and those of the National and Provincial Sponsors (as required). 2.13.3. $1.00 per item sold that STAC does not supply will go toward STAC, host keeping the rest. 2.13.4. A percentage of each item sold that STAC supplies goes toward host, STAC keeping the rest. The percentage amount will be disclosed to the host 6 months prior to the tournament. 2.15. All players, officials, referees, lines judges and volunteers MUST complete an official STAC membership registration form or affiliated PSGB/Club form to be insured under STAC's insurance policy. 3.1.1. Teams/regus coming to compete in the nationals must be no less than the 1st or 2nd ranked teams/regus in their city/area/province, decided by an advertised qualifying tournament. 3.1.2. The STAC office should be informed of each city's/area's/province's qualifying tournament at least two months in advance, by receiving their completed tournament check list form & poster. 3.1.3. All participants in qualifying tournaments must be members in good standing of STAC and a copy of all membership registrations must b sent to the STAC office with the fees enclosed before the tournament date. 3.1.4. The organizing committee for the respective qualifying tournaments are required to fax/email a list of media contacted for their event (name, position, company, phone No., fax No.) at least 2 weeks before the tournament. 3.1.5. The organizing committee for the respective qualifying tournaments are required to fax/email the tournament results to the listed media and the STAC office ASAP after the conclusion of the final match of the tournament. 3.1.6. The STAC office should receive a copy of any media coverage (newspaper, radio, TV) as soon as possible after its release. 3.2.7. Appropriate height, weight and fitness. 3.2.8. The STAC Board and National Team Standing Committee shall appoint team managers and coaches. 3.3. If only 2 or 3 players from the national team/regu may attend an event, the team may chose from the eligible list provided by STAC who their 3rd or 4th player will be (must be a member in good standing and must be playing Takraw regularly). 3.4. If the national team/regu, for unforeseen circumstances, is unavailable to represent Canada in an event, then players of the silver and bronze medalist teams will have first option to play in their stead, providing they are members in good standing and have been playing regularly. 3.5. If only one player from the national team/regu is available, the team/regu will be considered unavailable, but that one player may be considered to be the reserve player for the team/regu that plays in stead. 3.6. Each individual player of the national team/regu must notify the STAC office in writing (signed letter sent by fax) whether or not they are available to represent Canada in an event within one week of being notified of the event. 3.7. To secure their participation, players that indicate that they are available must send a certified Cheque of $250 to the STAC office within 2 weeks of being notified of the event. 3.8. The confirmation Cheque will be returned to players after their commitment has been established (i.e. they show up for the event). 3.9. If a player fails to honor their commitment, their $250 deposit will not be returned, but will instead be deposited into the STAC account (unless the board feels that the reason for not being able to keep the commitment is one that can justify returning it). 3.10. Because of a very limited budget, STAC is typically not responsible to pay up front costs on behalf of players. However, in the case that monies are spent on behalf of a player and then that player does not follow through with his/her commitment, he/she must pay the money back, or face STAC’s disciplinary and/or other legal consequences. 3.11.2. Personally - 5 to 7 days per week doing: flexibility stretches, exercises, body conditioning and fitness training, goal setting, basic Takraw skill development. 3.11.3. Team Training - 2 to 3 days per week: doing drills and activities for defensive and offensive skills development, playing practice games against other teams. 3.12.1.1 The team/regu should arrive at the game facility at least 1 hour before each game to properly warm up. 3.12.1.2 Positions/substitutions/time-outs will be decided by the coach & team manager with player input - in the case there is no team manager or coach, the designated team captain makes the final decision. 3.12.1.3 The highest level of good sportsmanship and respect to teammates, coaches, team managers, officials and opponents is expected. 3.12.2.1 After each game the team/regu is expected to meet to analyze and evaluate all aspects of their play (including watching themselves on video if recorded and if proper facilities to do so are available). 3.12.2.2 The team/regu should meet over breakfast each morning to go over the events, games or activities of the day. 3.12.2.3 All team members are expected to attend scheduled events that they are invited to as a team by their hosts. 3.12.2.4 The team/regu is encouraged to do things together in their free time to build up a positive team spirit and unity. 3.12.2.5 In all the team/regu does off court, their conduct is expected to be in accordance to the law, respecting the culture of the host country, and displaying behavior that is conducive to good sportsmanship and integrity. 3.12.2.6 Each team member is expected to be well-rested before games, adhering to any curfew that team officials may feel necessary to set and/or using their own common sense. 3.13.1. Failure of national team members to comply with what is expected of them in the above mentioned policies will result in disciplinary action determined by the STAC board of directors and national team committee. 3.14.1. The team manager shall be responsible for bringing a small first aid kit to any tournament or game events. 3.14.2. The team manager is also responsible for confirming the kind of medical support and services provided by the host country and what the procedures are in case of a medical emergency. 3.14.3. Each player is encouraged to take out extra travel insurance ($1.00/day with CAA) and insure all their immunization shots are up to date. 3.14.4. In situations were Visas are required, the STAC office will assist team members in the application process if it would prove to be more efficient, otherwise each individual should look after their own. 3.15.1. Until STAC can budget for it, the purchase of gifts to exchange with other countries will be the responsibility of the team members themselves, although the STAC office will help with ideas. 3.15.2. Gifts received, therefore, will be divided up among team members, but any significant, major gifts will be reserved for sponsors and/or the STAC office to display. 3.16.1.1 Each player is responsible for filling in and faxing training reports to the STAC office (provided by STAC) on a monthly basis, and will include: daily training routine, weekly training schedule, games, tournaments, training facility (ies), injury status, PR activities, and pictures & video footage if possible. 3.16.2.1 The team manager shall be responsible for submitting a report to the STAC office ASAP after any tournaments or events that the national team participated in, and should include: game results, technical information & changes, events, food & accommodations, recognized achievements, media coverage, general comments & event evaluation, and pictures and video footage if possible.